You won’t believe how easy it is to prepare these little morsels of goodness. Equally surprising is how flavorful these potatoes are with just a few key ingredients. 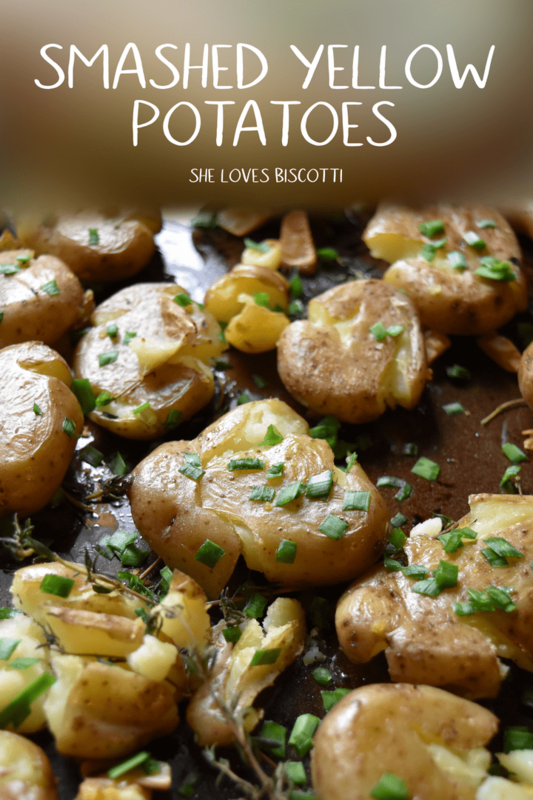 In the past, I have already shared a few of my family favorite potato recipes. Starting with my mom’s recipe for these Italian Potato Croquettes, that are not only convenient because of the ability to make ahead and just reheat, but because they are so, so tasty. This recipe for Oven Roasted Garlic Potatoes are just a must when served along side pot roasts or chicken dinners. 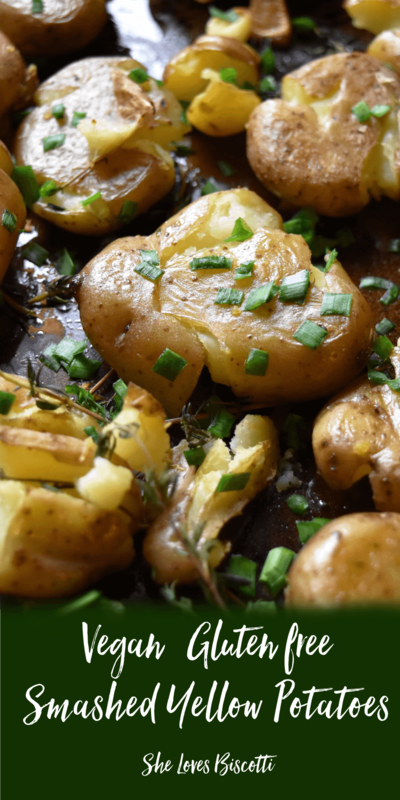 Today, I’m excited to share another roasted potato recipe with you… so let’s begin! The whole process starts with some miniature creamer potatoes. I decided to try this recipe using fingerling potatoes from the Little Potato Company «non–sponsored». In fact, you can achieve fantastic results with just about any of their unique little potato varieties, just make sure to adjust the baking time. Place the potatoes and salt in a large pot of cold water. Make sure all the potatoes are well submerged in the water. PRO TIP: It is important to begin this process with cold water so that the potatoes cook evenly inside and out. Once the water begins to boil, reduce to a simmer and cook for about 8-10 minutes or until a sharp knife can easily pierce these creamer potatoes. Drain and place the potatoes back in the pot along with a few cloves of smashed garlic. Add a couple of tablespoons of extra virgin olive oil and swirl the potatoes around until they are well coated. Allow to cool off for about 10 minutes. While waiting for the potatoes to cool down, you can get started on chopping the chives. I’ve had chives in my herb garden for decades. Since they are perennials, they usually come back, year after year. They are also one of the first herbs to appear in the spring and today I am taking advantage of that. Did you know there are two kinds of chives? 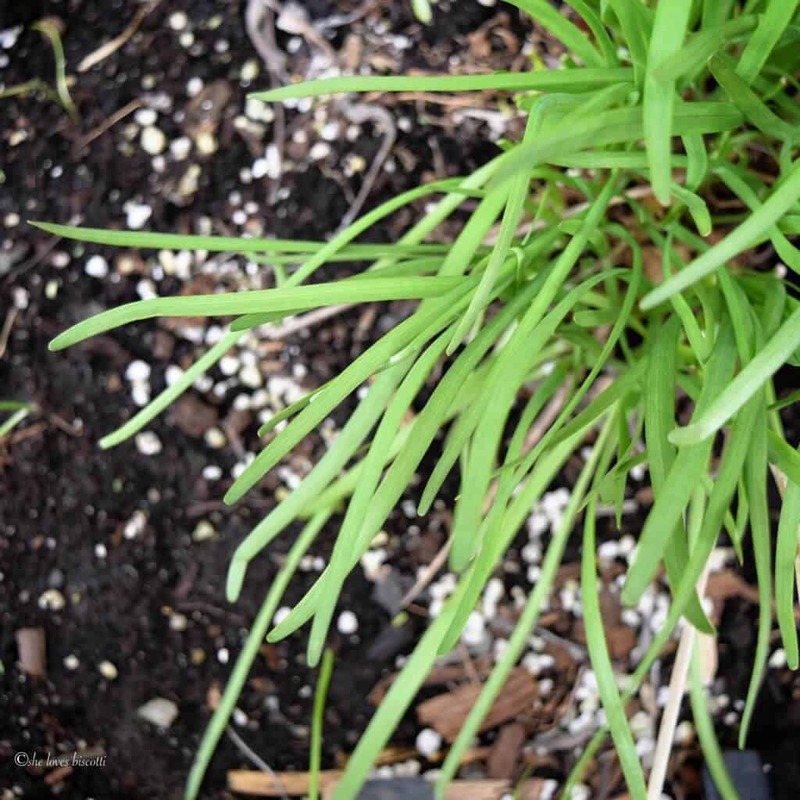 Garlic chives have mildly garlic flavored-leaves which are flat and will yield edible white flowers. Regular chives have mildly onion-flavored leaves which are round and hollow. The latter will yield pretty purple blossoms, which are also edible. Both varieties pair perfectly with our smashed fingerling yellow potatoes. So by now, our potatoes have cooled down. Drizzle your baking pan with about one tablespoon of olive oil and grab your potato masher. Transfer potatoes on a baking sheet and with the help of a potato masher, lightly smash each potato. If you do not have a potato masher, you can always use a fork or even a thick-bottomed glass. Drizzle another tablespoon of olive oil over the smashed potatoes and add a few springs of thyme. Bake in a preheated oven set at 450°F for about 20-25 minutes, turning them over at the half way mark. Once they are done, remove from the oven, sprinkle generously with garlic chives and serve immediately. Please note that you can use any herbs with these smashed potatoes: cilantro, parsley and tarragon are all great options. You can also sprinkle paprika, cayenne, cumin or even chili powder if you like heat. As far as other toppings are concerned, I am going to put on my dietitian’s hat and encourage you to enjoy this wonderful unrefined, unprocessed and whole food as is. There really is no need to cover up this wonderful spud. Just in case you are looking for more potato recipes, take a minute and look at this recipe for my potato croquettes… they are guaranteed to be a hit! I have no doubt that you are familiar with the concept of smashed potatoes. A quick google search will result in over two million results. I first tasted these smashed potatoes at a dinner party hosted by my sister-in-law. This recipe from Martha Stewart was her inspiration, which in turn inspired me. Use quality creamers topped with the best olive oil and fresh herbs to achieve the perfect side dish in the form of these tasty Garlic Chives Smashed Fingerling Yellow Potatoes. ★★★★★ If you have made this Smashed Fingerling Yellow Potato recipe, I would love to hear about it in the comments below and be sure to rate the recipe! Place the potatoes in a large pot of cold salted water and bring to a boil. Cook for approximately 8-10 minutes or until a sharp knife can easily pierce the potato. Drain and place the potatoes back in the hot pot. Add 2 tablespoons of olive oil and the smashed garlic cloves and combine with the hot potatoes. Allow to cool down for about 10 minutes. Drizzle baking pan with about 1 tablespoon of olive oil. Transfer potatoes on baking sheet and with the help of a potato masher, lightly smash each potato. Drizzle another tablespoon of olive oil over the smashed potatoes and add a few springs of thyme. Bake in a preheated oven set at 450 °F for about 20-25 minutes, turning them over at the half way mark. Once they are golden brown, remove from the oven, sprinkle generously with chives and serve immediately. IF YOU ENJOYED THIS SMASHED YELLOW POTATOES RECIPE, SAVE IT FOR LATER. PIN IT TO YOUR SIDES BOARD! Looks amazing!!!!!!!!!!!!!!!!!!!! Definitely going to use this recipe in the near future! Maria, now this is the ultimate comfort food! Simple quality ingredients make all the difference. Smashed Potatoes are perfect with just about any entree and certainly a special when paired with a green salad. These do look delicious and your photos are beautiful.